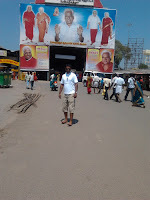 This very place is known for "Adi Parasakthi" temple situated just off the national Chennai - Trichy NH 45 High way. It is believed that in this place 21 saints both men and women had their Jeeva-Samadhis (meaning, where the Siddhars/Saint left their human forms behind, while they are still alive as holy spirits). The main deity is Goddess Amman in a sitting posture expressing obeisance to the Swayambu Lingam (Self manifested Lingam). The Lingam is said to be found under the Neem tree which got uprooted during the 1966 cyclone. Devi Amman is said have done pooja's to this Lingam. The Sanctum Sactorium houses this Lingam with the Amman Idol. "Ore Thai, Ore Kulum" (One Mother, one Humanity) is what the tenet of this temple and is being practiced among the devotees. The devotees are permitted to enter into the garbha griha (inner chamber) & pray to the Goddess though we just entered around 1 pm (closing time) we weren't allowed for the same. The uniqueness of this temple is it's administered by Shri Arul Thiru Bangaru Adigalar (see the poster on my back in above pic) who as per devotees is believed to be a personification of the Devi Amman herself and is addressed as AMMA (mother) only. Devi Amman is said to transmigrate into Arulthiru Bangaru Adigala body to spell oracle time to time. Thousands of devotees have witnessed this miracle. Amma lives on the back side of the temple.They takes Rs 1000 to witness the Amman Oracle through Sri Adigalar, in that AMMA will call only the few to solve their problem's through Oracle. There are certain days in a week where this rituals is performed, i didn't bothered to hear the Oracle as i believe if its destined to happen then i can't change and if i can't change it is better not to know it beforehand, bottom line i just wanted to save my thousand bucks.
" Do not try to analyse me and my ways. They are beyond your intellectual power". AMMA wants to set an example to the world showing even grahast man (family man) can practice spritualism. 3rd March was the 71st birthday of AMMA. Photography is not allowed inside the temple and I didn't bothered to sneak in through my mobile phone either (though you can carry mobile in, but not allowed to shoot). Free lunch are provided here. Talking about amenities, there isn't much here as an option. An decent hotel "High way Inn" is situated few km away from here where you can have a vegetarian south indian food. Well its just 92 km from Chennai and is just off the NH45 highway and falls 25km before the Tindivanam. It's a straight single road from Chennai and is well connected through train and buses. Local shops are piled up just outside the temple but not enough hotels or restaurant as i expected, and don't have the covered parking as well. Came here blog hopping on travel blogs and liked yours. Do drop by my blog too sometime.